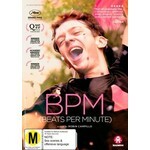 Winner of over 20 international film awards, including the Grand Prix at the Cannes Film Festival, BPM (Beats Per Minute) is the remarkable new film from Robin Campillo (They Came Back, Eastern Boys). In Paris in the early 1990s, a group of activists goes to battle for those stricken with HIV/AIDS, taking on sluggish government agencies and major pharmaceutical companies in bold, invasive actions. The organization is ACT UP, and its members, many of them gay and HIV-positive, embrace their mission with a literal life-or-death urgency. Amid rallies, protests, fierce debates and ecstatic dance parties, the newcomer Nathan falls in love with Sean, the group's radical firebrand, and their passion sparks against the shadow of mortality as the activists fight for a breakthrough. 5 stars "Full of cinematic life", "compellingly combines elegy, tragedy, urgency and a defiant euphoria." "An impassioned and incendiary cry from the heart", "BPM musters the emotional power to floor you."